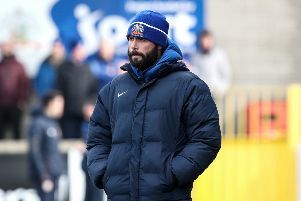 Brendan Shannon is backing Portadown to turn the tables on a 12-point deficit – with a helping hand from home advantage. The Ports kicked off the Danske Bank Premiership by beating Ballinamallard United on the opening day at Shamrock Park. That victory handed an early boost in the bid to wipe out a punishment imposed on the club by the Irish Football Association. Defeat last weekend to an Ards side managed by Portadown-born Niall Currie served as a setback, but Shannon is confident the collective morale remains high ahead of Glentoran’s visit to town on Saturday. “We have been talking within the team and manager Pat McGibbon is certainly keen to make the most of our home fixtures,” said Shannon, one of the summer signings during McGibbon’s squad overhaul. “The pitch is in brilliant condition thanks to so much close-season work. “I really feel the brand of football we want to play could be most effective at home. “Plus, of course, you want to have the home crowd behind the team in numbers and, hopefully, we produce the right style of play to gain that backing. “It was a brilliant feeling walking off the pitch with fans applauding the players. Shannon has enjoyed his start to life with the Ports and is relishing future progress. “The group has managed to gel quite quickly,” said Shannon.